We’d like to thank all of the attendees at this year’s Phoebe Institute on Aging (PIA) 2019 Benefit, which took place at DeSales University on Thursday, March 21, and focused on generations coming together. The goal of the PIA Benefit is to raise funds to support educational opportunities for health care workers and the community. Roughly 200 attendees enjoyed a music themed evening with multiple musical group performances throughout the event, hors d’oeuvres, cocktails, dinner, a drawing to win a custom-made, diamond cross necklace, a wine pull raffle, and an awards presentation. Décor throughout the event space sang its own musical melody, with an interactive creation of a pictorial display of a G-clef note, highlighting pictures of Phoebe residents engaged in various activities. Music notes were placed on every table, and records displayed throughout the main event room. Attendees were treated to intergenerational performances by The Girls Next Door, Muhlenberg College’s all-female a cappella group, the Parkland Strolling Strings from Parkland High School, and Phoebe’s own resident Piano Quartet. 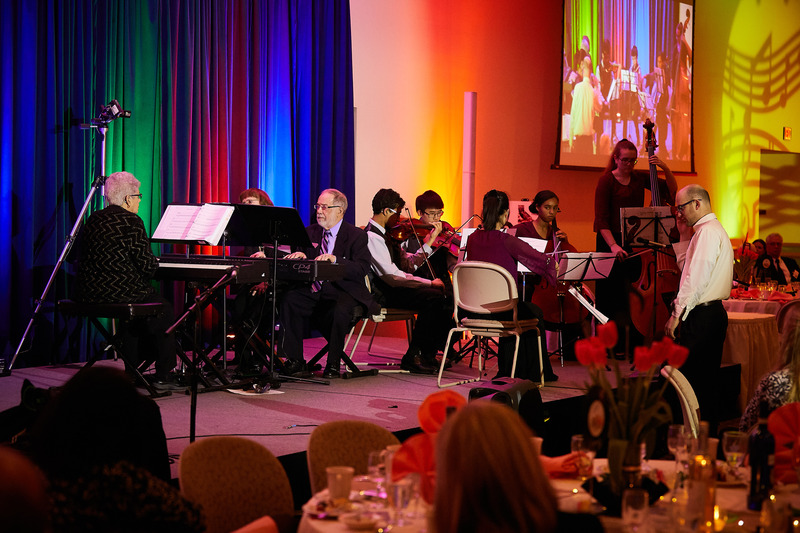 Music was presented throughout the entire evening, including the Parkland Strolling Strings making rounds throughout the crowd during dinner, and culminated with a collaborative performance including Phoebe residents and high school students at the end of the night. Ronald L. Rider was honored with the Rev. Dr. Grant Harrity Award for Exemplary Service to the Aging. The Rev. Dr. Grant Harrity Award for Exemplary Service is presented annually to an individual whose leadership, service, and commitment advance the aging services field. Recipients of the award are celebrated for fostering innovative thinking, collaboration, and collective learning. In addition to the Rev. Dr. Grant Harrity Award, Exemplary Volunteer Awards were presented to Phoebe Allentown volunteer Stan Harwick, Phoebe Richland volunteer Robert Crouse, Phoebe Wyncote volunteer Stephanie Udell, and Phoebe Berks Junior Award recipient Breydan Cone. The award is presented to individuals or groups who show long term commitment and support of Phoebe and our residents by giving their time to others. All awardees were also presented proclamations from Sen. Pat Browne. The Rev. Dr. Grant Harrity Scholarship was awarded to two Phoebe Allentown employees, Shannon Maguire and Laurine Nyanya, during the dinner. This benefits direct care employees of Phoebe Allentown currently enrolled in a career enhancement program. Upon accepting their scholarships, both women spoke of Phoebe’s stellar reputation as one of the best organizations in the area, and credited their workplace and mentors for their compassion to help seniors and their drive to further their education. We’d like to especially thank our Gold Sponsor, Arbor Insurance Group, along with all of our other sponsors and attendees. Phoebe is able to provide educational opportunities and conferences at low or no cost to attendees thanks to the generosity of the Benefit’s sponsors and attendees. For more information on the PIA Benefit, please contact dfrey@phoebe.org.